After riding all day in sunshine hotter than a preacher’s knee, a cowgirl can get some mighty chapped lips. 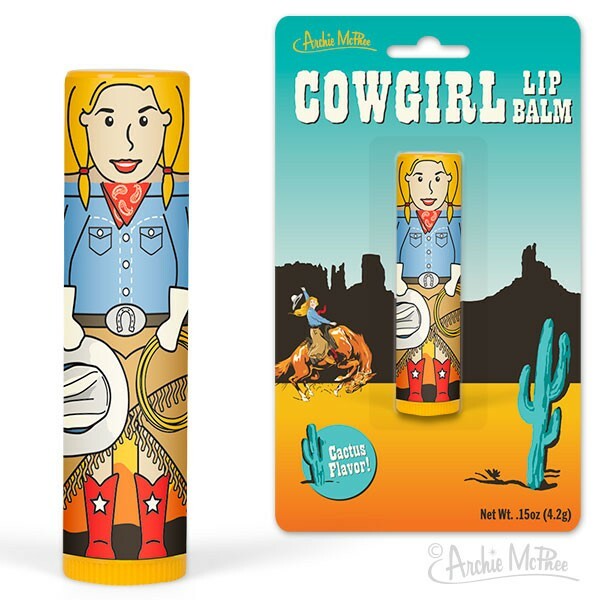 This cactus-flavored lip balm not only looks like a tough cowgirl, but can protect your lips from being drier than the heart of a haystack. Each tube is 2-1/2" (6.4 cm) tall with a twist bottom dispenser. Illustrated blistercard. Mineral Oil, Polybutene, Ethylhexyl Palmitate, Aloe Barbadensis Leaf Extract, Ozekerite, Synthetic Wax, Caprylic/Capric Triglyceride, Beeswax, Methylparaben, Propylparaben, Tocopheryl Acetate, Titanium Dioxide, Fragrance. Keeps lips moist and meaty. 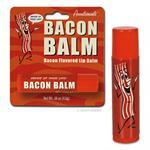 Lip Balm with Succulent bacon flavor.